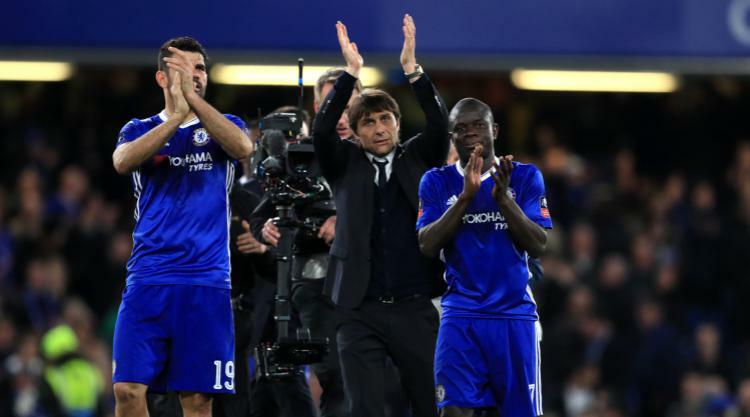 Chelsea moved within three points of the Premier League title and consigned Middlesbrough to relegation with a dominant 3-0 victory at Stamford Bridge. Goals from Diego Costa, Marcos Alonso and Nemanja Matic saw Chelsea re-establish a seven-point lead over Tottenham. And Antonio Conte's men can win the title before Spurs next play with victory at West Brom on Friday night. Costa scored his 20th league goal of the season, converting a pass from the excellent Cesc Fabregas, and Alonso netted from a similar position before half-time. And Matic struck in a second-half which began with Pedro hitting the bar as Brad Guzan conceded through his legs for a third time. It could have been many more for the champions-elect in a one-sided contest. Boro, now with one win in 19 league games, will be playing in the Sky Bet Championship next season after a record-equalling fourth demotion from the Premier League. The visitors' night began with a bump. A minor nudge in rush hour traffic contributed to the delayed arrival of the Boro bus. History was also against Boro, who were without a league win and had not even scored in seven games at Stamford Bridge since 2001. Chelsea's in-house TV channel showed the 1997 FA Cup final between the teams prior to the match, when Roberto di Matteo scored after 42 seconds. Chelsea play Arsenal in the FA Cup final on May 27 hoping to complete the season with the double. Di Matteo and his predecessor as Chelsea boss Andre Villas Boas lost their jobs after defeats at The Hawthorns. Conte goes there on Friday seeking the title in his first season as head coach.